Thomas Hylton, a Pulitzer Prize-winning journalist, is author of a color coffee table book called Save Our Land, Save Our Towns. The book is a plea for comprehensive planning to save our cities, towns, and countryside. Hylton is also host of an hour-long public television documentary called Save Our Land, Save Our Towns. The program has been broadcast prime time on all Pennsylvania PBS stations and has aired on more than 100 PBS stations nationwide. As president of Save Our Land, Save Our Towns Inc., a non-profit corporation, Hylton serves as an advocate of traditional towns that house people of all ages, races, and incomes. Since publication of the book, Hylton has given 450 presentations in Pennsylvania and 34 other states on land use planning and community building. He addressed the nation's governors at the winter 2001 conference of the National Governors' Association. He has given talks to legislators sponsored by both the Democratic and Republican caucuses of the Pennsylvania House and Senate. Hylton is an organizing member of 10,000 Friends of Pennsylvania, a coalition of civic groups dedicated to land use reforms and community building in Pennsylvania. 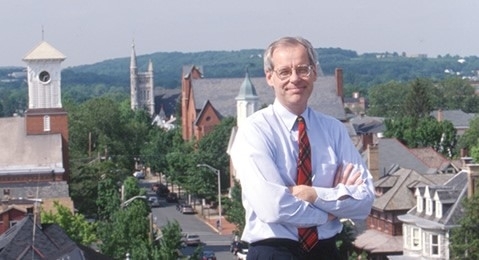 A three-time winner of the American Planning Association's annual journalism award, Hylton received a fellowship from the Society of Professional Journalists in 1993 to study state planning issues. A native of Wyomissing, Pennsylvania, Hylton has lived all his life in Pennsylvania cities and towns. Since 1973, Hylton has lived in Pottstown with his wife, Frances, who retired in 2008 after teaching in Pottstown elementary schools for 35 years. For 22 years, Hylton wrote for Pottstown's daily newspaper, The Mercury. His editorials advocating the preservation of farmland and open space in southeastern Pennsylvania won a Pulitzer Prize in 1990. Hylton conceived and organized Trees Inc., a non-profit corporation that raised nearly $500,000 to plant and maintain street trees in Pottstown. He co-founded Preservation Pottstown, an organization dedicated to preserving Pottstown's historic neighborhoods and enhancing the borough's quality of life. He helped bring about the integration of Pottstown's elementary schools through a special edition of The Mercury advocating the cause. Hylton is a member of the Pottstown School Board. He previously served 12 years as chairman of the Pottstown Planning Commission and 15 years as chairman of the Pottstown Shade Tree Commission. In 2003, Pottstown Council adopted an innovative "user-friendly" zoning ordinance Hylton wrote with a grant from the William Penn Foundation. Hylton provides his services to Save Our Land, Save Our Towns pro bono.